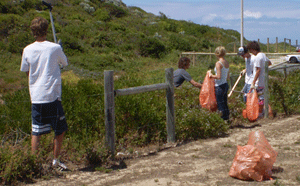 Keep Australia Beautiful’s Adopt-a-Spot program is a simple way for individuals, community groups and businesses to do their bit for a cleaner environment. Adopting a spot means making the commitment to help keep a nominated site litter-free for two years by hosting three to four clean ups per year. Got a favourite spot you’d like to keep naturally beautiful? Getting involved is easy. Arrange a date for your first clean-up. Many hands make light work so get your friends, family and community involved to help. Ensure to register your clean-up event with Keep Australia Beautiful to receive your FREE clean up kit in the mail (includes gloves, litter bags and tongs). Get cleaning and make sure to tell us how you went. Keep Australia Beautiful WA provides free insurance to volunteers conducting clean ups through the Adopt-a-Spot program. The City of Wanneroo encourages participants to sign up for this coverage during the registration process. Registering to Adopt-a-Spot provides many benefits to volunteers and community alike. You will join hundreds of Adopt-a-Spot groups across Western Australia who are all making a difference by adopting their spot for regular clean-ups. Here’s what participants from around the City of Wanneroo have to say about the program. We live in a beautiful part of the world. Let’s keep it that way. I pick litter on my daily walk. Easy to do, others see you doing it. Reminds them people do care. We have participated in Adopt A Spot for the last 3 years and regularly collect litter with our children. There aren’t too many ways that you can volunteer as a family but Adopt-a-Spot gets us all out there as a family and we’d encourage everyone to give it a go. It might not be our litter but it is our planet and it’s a great opportunity to get involved in something for the greater good as a family unit. I would like to see more people Adopt a Spot, as in my experience I find that when an area is covered in litter, offenders are more likely to throw their own litter in the same spot. Similarly, if an area is free of litter, it encourages the public to keep it looking good. I am an Early Childhood Teacher and my philosophy is strongly based on sustainability and looking after our environment. By signing up for Adopt a Spot, we have a sense of responsibility to take care of our precious bushland and park that we use on an almost weekly basis and it creates a sense of pride and fosters a love of nature. By signing up and making it “our” park, we endeavour to foster an understanding in children that our bushlands and parks play a vital role in our communities and that the more people look after it, the more we can all enjoy these areas - animals and people alike.